Cajun Rollergirls for the win! 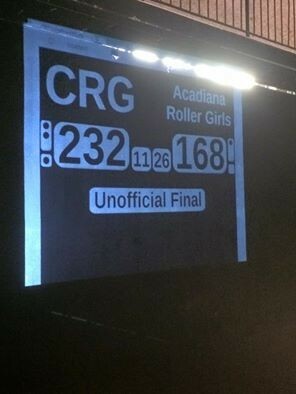 Your final score from Big Warren – your Cajun Rollergirls take home the win over the Acadiana Roller Girls. Big thanks to ARG for coming out! Thanks also to our officials, volunteers and those who came out to watch the action. Our next game is April 11 at home vs. the Pensacola Roller Gurlz! See you there! IT’S BOUT DAY!! Cajun Rollergirls and Chili!